We often get asked how to choose a ruler and well it depends on the project your working on. The basic criteria I look for in rulers is that they are safe, those that have non-slip features to add stability while I’m cutting. (I speak from experience, after deeply cutting into a finger when my ruler has moved from the travel of my rotary cutter.) I also look for numbers on measurements that are easy to read to help with accurate cutting and I can see my fabric through the ruler. 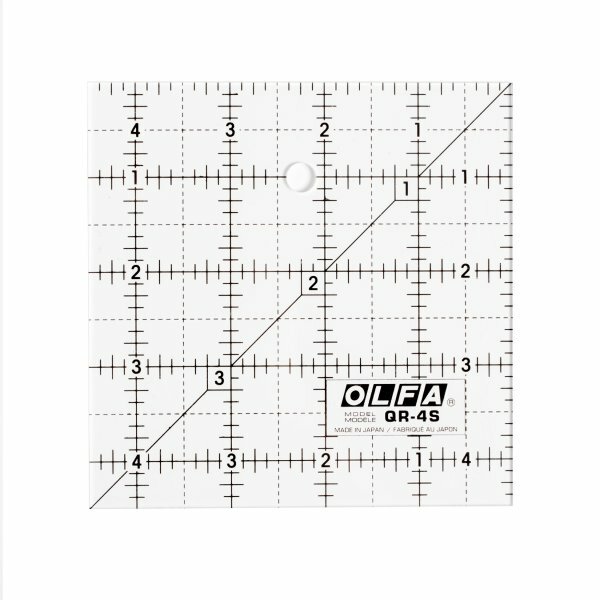 The frosting in OLFA’s Non-Slip, Frosted Advantage™ Acrylic Rulers allows the imprinting to be read effortlessly over dark, light or patterned fabrics and materials and are non-slip for extra stability while cutting. Like a cutting mat, I am most fond of rulers marked with 1/8″, 1/4″, 1/2″ and 1″ increments. After all, the mat and the ruler are used in tandem to make sure all sides of a strip, patch or block is accurately sized. 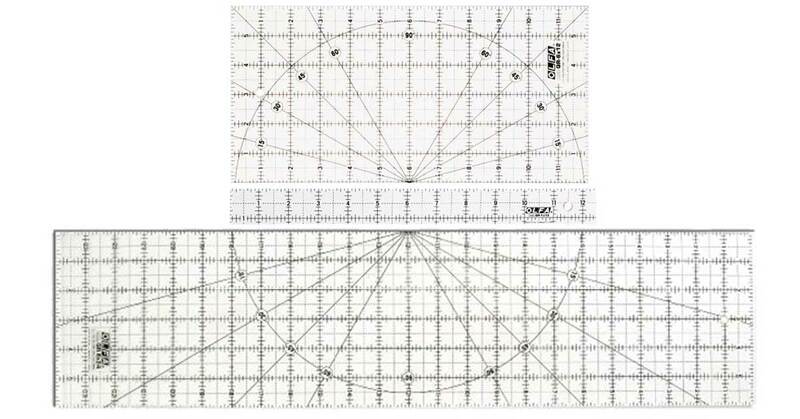 To this end, many rulers also include a Compass Pivot Point with angles for 15⁰, 30⁰, 45⁰, 60⁰ and 90⁰ cuts. Rectangular rulers are the most commonly used tools, however, block-size rulers are also very handy to have available, another way to ensure you get the correct finished block size. Here are the common ruler sizes and examples of projects where they are used. 1¼” x 12 ½”, 6” x 12” and 6” x 24” Rulers: I am constantly interchanging these rulers when I’m cutting fabric. I use the 6” x 12” one to cut patches, from a fat eight or quarter or patches from a strip of fabric for example. I generally use the 6” x 24” ruler to cut strips from fabric yardage because it can span across the width with a minimum number of ruler moves. I find the 1¼” x 12½” ruler really convenient to cut apart Triangle Square units and to clean up the ¼” seam allowance while I’m foundation piecing. Block-Size rulers are extremely useful for trimming the edges of a quilt block. I’m grateful they come in common pre-finished block sizes, 4½”, 6½“, 9½“, 12½“ and 16½“. 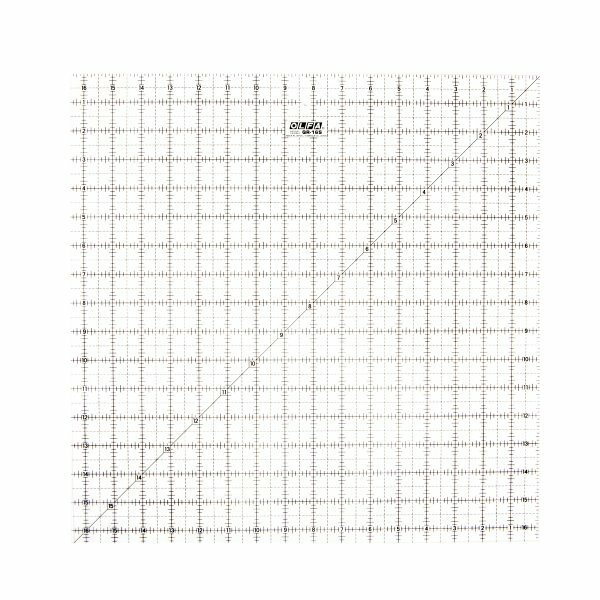 4½” Square Ruler: Quilters can use it as a template for 4″ squares, baby quilts and more. 6½” Square Ruler: Use it to square up corners of blocks, for marking and cutting patchwork and miniature quilts. 9½” Square Ruler: Use as a template for squaring up to 9″ blocks, borders and backgrounds and for cutting squares, triangles and strips. 12½” Square Ruler: This ruler is not only great for squaring pieced, applique and foundation blocks and cutting larger pieces, it’s also very useful for making templates for pillow tops and for simple square patchwork designs. 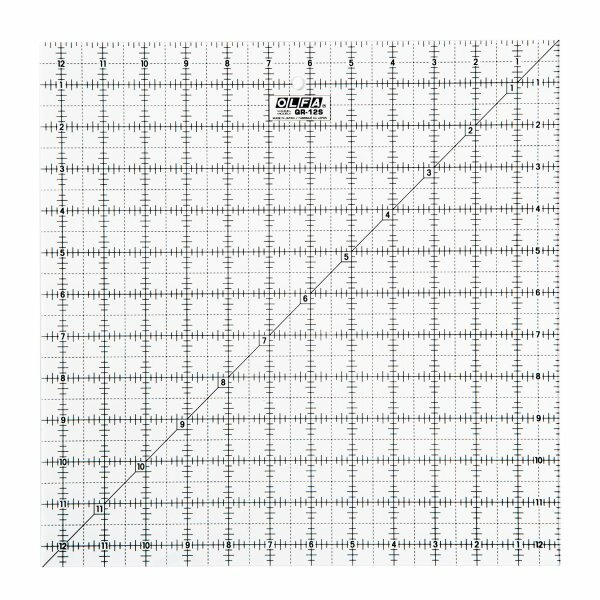 16½” Square Ruler: Use this ruler for squaring larger blocks, borders, pillow templates and for square designs. Brought to you by The Quilting Company & OLFA North America.